What is a Clinical Trials Network? Join us for a two-day intensive workshop where you will take away the knowledge and practical skills that are fundamental for designing adaptive clinical trials. You will get hands-on experience in applying cutting edge methods and numerical simulations using R and/or STATA. This event will also be held in Melbourne and Sydney . Clinical trials are the gold standard study design for assessing the efficacy and safety of an intervention. Adaptive designs are a novel approach to improving the efficiency and ethical properties of clinical trials. With an adaptive design, information gathered during the trial can be used to change the design in a statistically robust way. There are many types of adaptive designs that are possible for different situations ranging from phase I to phase III. In both adaptive and non-adaptive trials, there are often multiple hypotheses being tested. Examples include trials with multiple endpoints, multiple treatment arms and when a trial tests a treatment in different patient subgroups. Adaptive trials often mean that a particular hypothesis is tested several times during the trial. This creates issues with multiple testing, for which suitable procedures are needed to ensure the appropriate error rate is controlled. In this course we will give an overview of multiple testing issues and adaptive designs in trials. 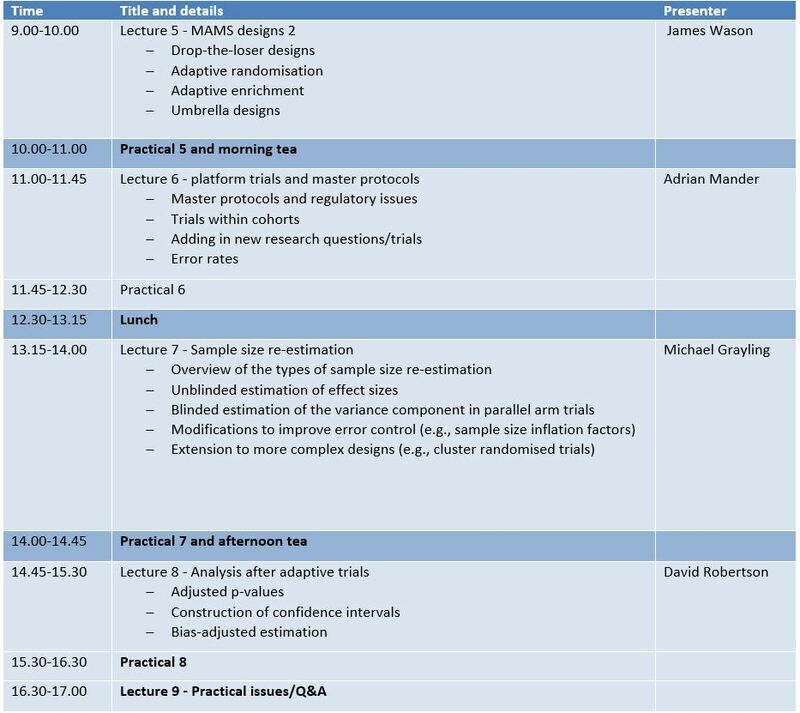 Participants will learn about a variety of new adaptive clinical trial designs, including multi-arm multi-stage (MAMS), umbrella studies and adaptive randomisation. 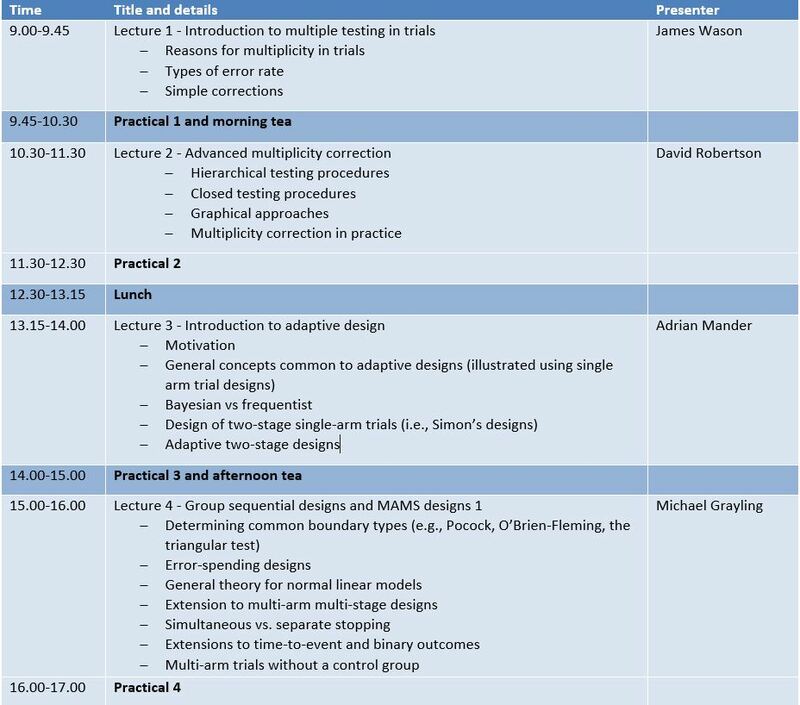 As well as learning about how to design adaptive trials we will cover the implications of the design on the analysis and practical aspects of running the trial. Throughout the course, real examples will be used to demonstrate the methodology. There will be a strong emphasis on learning how to use available software (in both R and Stata depending on the preference of the delegate) to implement the methodology in practice. The course is aimed at statisticians, although non-statisticians with strong quantitative experience would benefit from the course also. Experience in STATA and/or R is required, as is a laptop with the software loaded for the course. © Australian Clinical Trials Alliance.